Welcome to Share Your Creations party #52! I hope you will link up and join in the fun! This week I thought I would do something a little different. I thought I would feature the links that received the most traffic. This is not how I normally pick the features from the party. I really try to rotate and feature as many different blogs as possible. Most of the time I don't even check the number of clicks the links get. Lately I have been just because I've been curious to see how much traffic the party is getting and I've been very surprised! For instance, Liz at Savvy Seasons received 308 clicks! Wow! That's a lot of traffic. 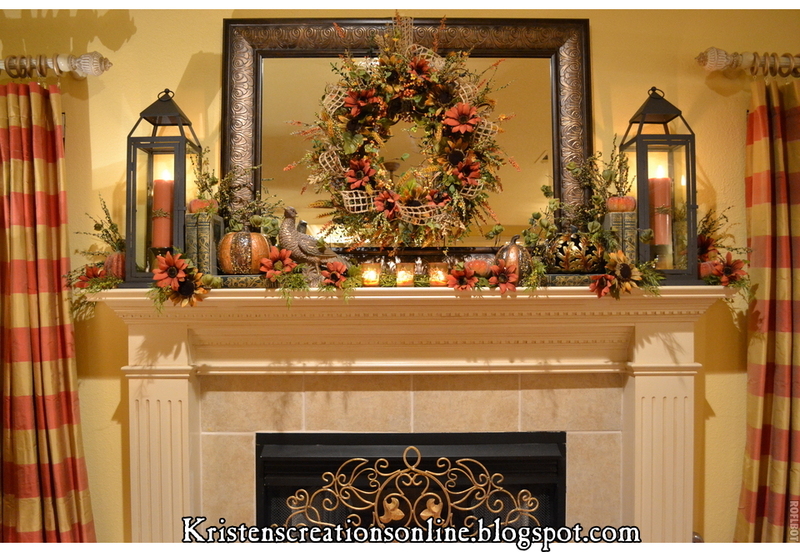 Her mantle is stunning! The second highest number of clicks goes to Maria Elena at Our Home Away From Home with 251 clicks. She shared her pretty laundry room that was redone a few years back. Third goes to Shenita at Embellishments by SLR with 232 clicks. 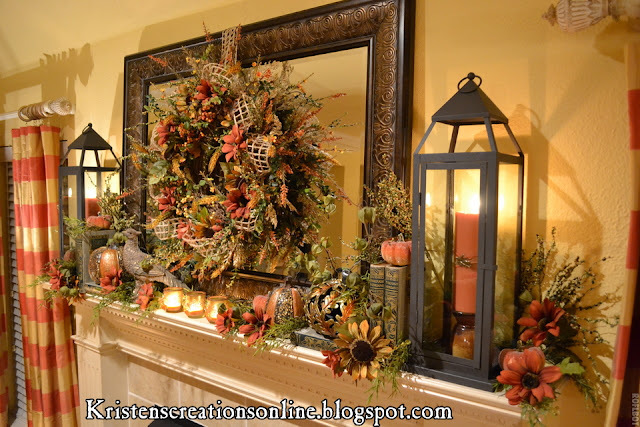 She shared her beautiful fall mantle where she added in some shades of blue. This is not a competition by any means and I only wanted you to see that people are checking you out! lol...There were several other blogs that had 150 to 200 clicks. When you go to link up you are able to choose a picture from your post. Try to link a photo that is more up close rather than set back. Also make sure the photo is eye catching and has good composition. Those are just a few little tips I've learned when linking to parties. I am in the middle of fall decorating, custom orders, and restocking my Etsy store right now. Everything is in a mess. I think this is the only small section of my house that looks decent that I would want to share! I added a basket of acorns, a leaf bowl and a container of wheat to the coffee table. I also added a soft throw blanket in a brownish gold color (sure don't need that yet) and a gold pillow with a rhinestone accent to the chair. I'll be sharing more pictures when I get everything in order. After all, it is still summer...just getting a head start! 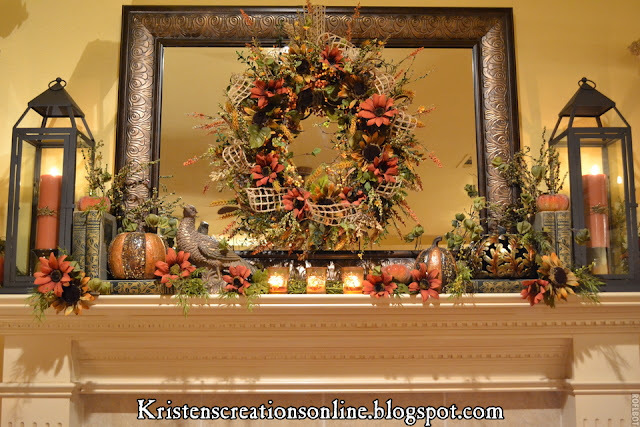 One more thing...Thank you for all of the sweet comments on my fall mantle. I really appreciate them!!! I have officially started my fall decorating! I am doing a little at a time and decided to start with the mantle. I put a lot of thought into the mantle this year and it turned out a little different than what I had in mind. Isn't that usually the case? I am pleased with it though and love the warm cozy feeling it adds to the room...especially with the candles lit. 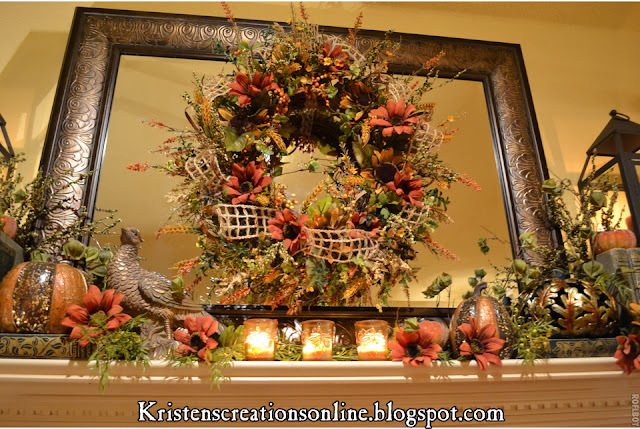 I have seen wreaths on mirrors in blogland and on Pinterest and thought I would try it this year. I found the mirror at Kirkland's for around $45 and added a little bit of gold rub n buff to bring out the design. I found the lanterns at Pier 1 Imports for only $30 each and then they were 20% off! I thought that was an excellent buy for those...they are tall and heavy! I added books, pumpkins, greenery, rust and gold sunflowers, berries, and the pheasant to finish it off. 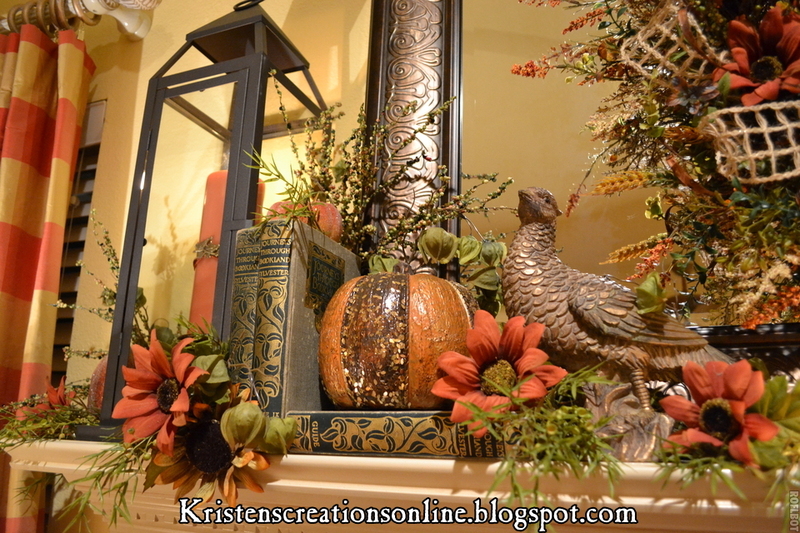 The pumpkins, votive holders and pheasant all came from Hobby Lobby...the pheasant was from last year. Hobby Lobby has all of their fall 40% off this week! They really do have some pretty things this year. 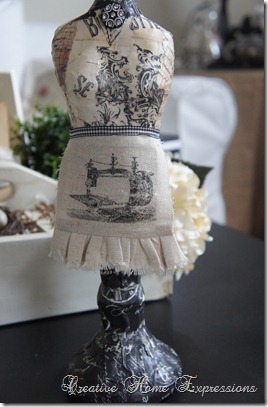 The burlap weave ribbon is very popular! They did have it at Hobby Lobby but ours is out now...thanks to me! I am able get it from one of my ribbon sources now. I like the texture it adds to the wreath. I added a rusty orange colored candles from Wal-Mart inside the lanterns and added a metal bird with ribbon around them. I like the way the metal bird piece dressed up the candles. This pumpkin is very unique with the leaves. Well, that's the fall mantle! I hope you enjoyed the pics and maybe even got some ideas for your own mantle. I am looking forward to seeing all of the fall inspiration out there! I know it's still a little early, but it's always good to get a head start. Check out my Etsy store for some new fall items! Joining Make it Pretty Monday at the Dedicated House and Stone Gable for Tutorials, Tips and Tidbits and The Everyday Home for The Better Late Than Never Fall Party. Welcome to Share Your Creations party #51! I hope you will link up and join in the fun. There were some great links last week! It was really hard to choose the features. Did you know I get the most visitors to my blog on party day? I'm not the only one who is wanting to see what you are creating. 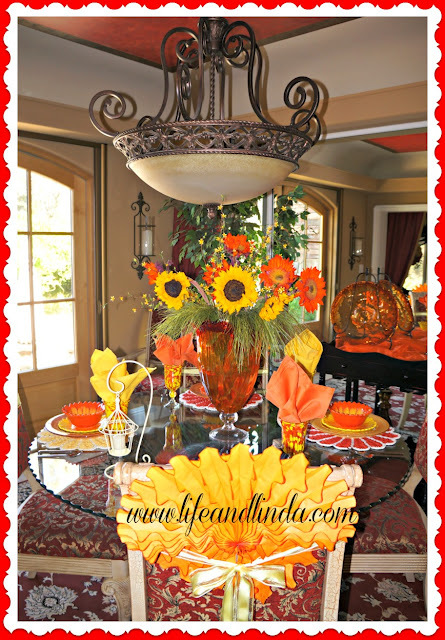 Linda at Life And Linda created a beautiful tablescape using colorful dinnerware and sunflowers. Love it! Kathy at Creative Expressions used scrapbook paper and mod podge to dress up this paper mache mannequin. She even sewed a cute little apron for it! I love this idea! Shenita at Embellishments By SLR has two daughters going off to college. They were both inspired by Pinterest to make a magnetic makeup board. All you need is a frame, material, a piece of sheet metal and magnets.What a great way to keep your makeup organized! I would appreciate a link back to my blog so others can find the party. Thanks! From the time I started this blog almost four years ago I've shown you Chase's first day of school picture every year. 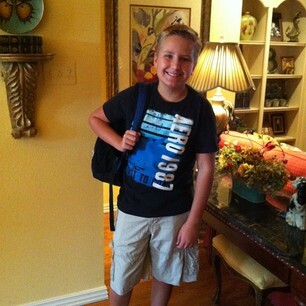 I can't believe he is going into the 7th grade! He just turned 13 this summer and is growing like a weed. We are hoping the teenage years don't bring us too much heartache! So far he is a really good kid and does well in school. I pray that he will stay on the right path and do what's right. Two of his best friends moved away this summer so I am also praying he will make lots of new friends this year...I'm sure he will! Another thing I am hoping to start on this week is a little fall decorating. I am starting with the mantle...here is just a little sneak peek of the added mirror and lanterns to start. Now what? Well, you will have to wait and see. I'm not even sure how it will turn out yet! lol...Do you see the reflection of my cabinet tops in the mirror? Yes, that is Sugar, my cat, sleeping up there in her favorite spot. I posted a pic of her up there on Facebook a while back and said I was going to try to keep her down. Well, I gave up. I just keep the antibacterial wipes handy all the time. Welcome to Share Your Creations #50! Wow! I can't believe I've been hosting this party for almost a year now. It sure doesn't seem like it's been that long. I sure do appreciate your links every week! I am always inspired by your creativity! Most of you know that I love red if you have seen my living room. So it is no surprise that this table caught my eye. 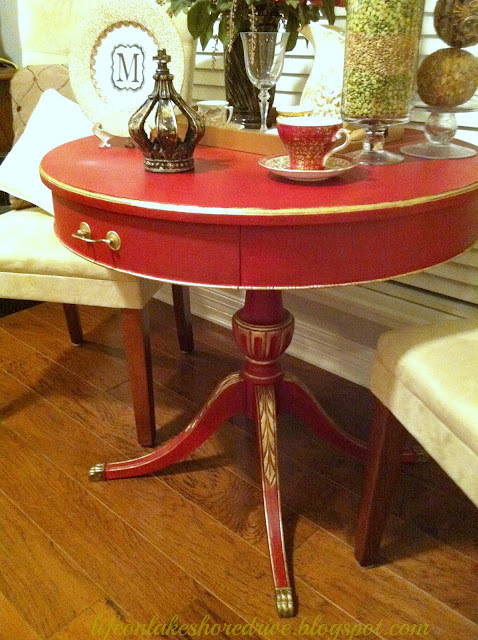 It was painted with Annie Sloan chalk paint in Emperor's red by Kathy at Life on Lakeshore Drive. She also added gold guilded wax around the edges. Beautiful! 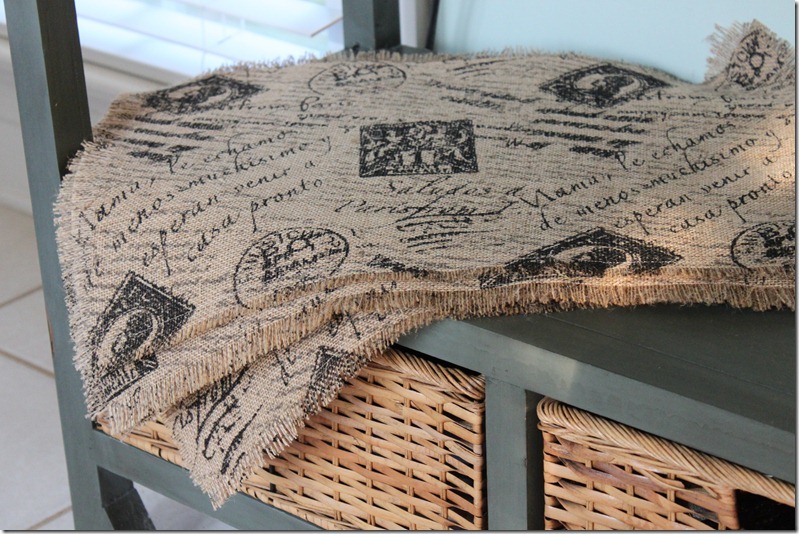 These french burlap placemats are so easy to make out of fabric from Joann's. Check out Pickles And Cheese for the tutorial. Cute! 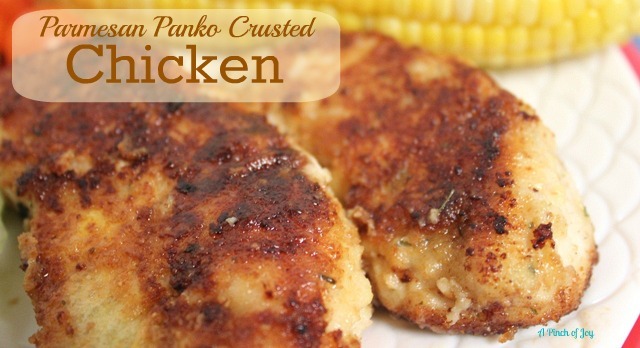 This chicken looks and sounds so good! Visit A Pinch Of Joy for the recipe. There are a lot of great recipes on this blog. I thought I would show you some fall items I have been working on. Some of them are custom orders and some are listed in my Etsy store. I am making two of these arrangements for double doors. I plan on making more of these...just waiting on the metal containers. Here are a few custom lantern swags I recently made for customers. I just listed this fall door swag in my Etsy Store. Loving the rich fall colors! He is in my store too! Here is a custom lantern swag and frame I made for a sweet lady. Thanks Nicole! I'm so glad you are pleased. I love hearing from my customers! That is just a little bit of what I've been working on. More fall to come! I thought I would show you a little fresh summer vignette I put together on my island the other day. Some of you might have seen it on my Facebook page yesterday. I found the burlap bee containers at T.J. Maxx a while back. I love filling them with fresh flowers when Wal-Mart has them on sale. These bundles were only $2 a piece...normally $4.99. The bee candle is Aromatique and the scent is sorbet. It smells so good! I love the wire stand I found at Kirkland's and have shown it before. I have been keeping apples in it and replacing them as they are eaten. I love the color they add too. These flowers are called alstromeria. I worked at a flower/gift shop for 15 years so I still remember the names of most flowers. Happy last days of summer! I guess it doesn't officially end until Sept.22. However, school starts next Monday so although the heat will stick around for a while, there will be no more lazy days for Chase. He will be in the 7th grade this year! It seems like I just dropped him off at Kindergarden. Time sure does fly! Welcome to Share Your Creations party #49! I hope you will link up and join in the fun! I always love to see what you are creating. What a great way to store reciepts! 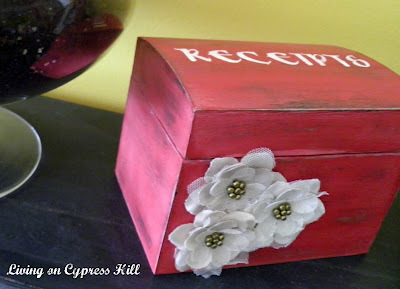 This cute box was painted and decorated by Misti at Living On Cypress Hill. Great way to stay organized! Yum! 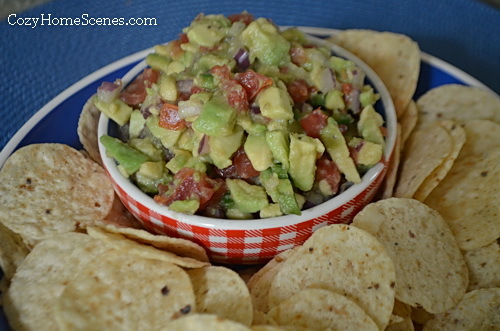 I love guacamole and this looks delish! Visit Cozy Home Scenes for the recipe. 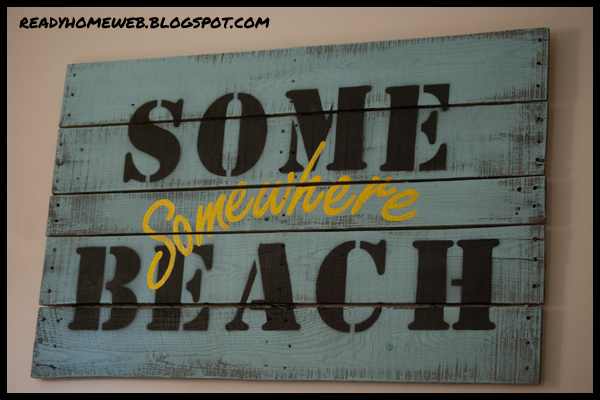 I love this sign that was made from a pallet by Ready Home. I have seen so many neat pallet projects in blogland. The possibilities are endless! For my creations I thought I would show you some more fall items I made for my Etsy store. I keep thinking that if I keep working on fall it will cool off! Ok, maybe not. However, fall will be here before we know it and I am getting an early start. 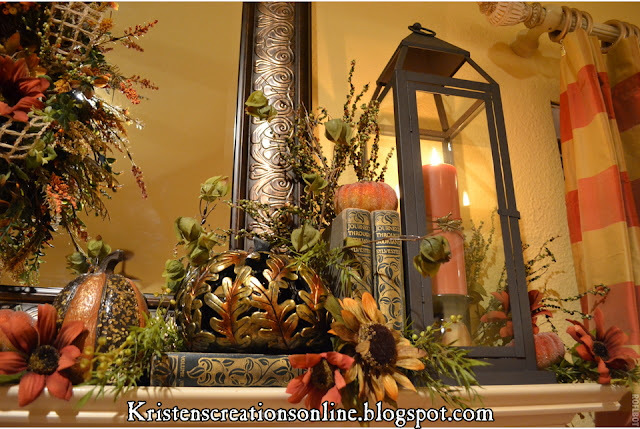 This arrangement would brighten up a door or wall for fall. Love the pumpkin container! I have already made several custom lantern swags and am making many more! I just got my shipment of fall flowers in today so get ready! 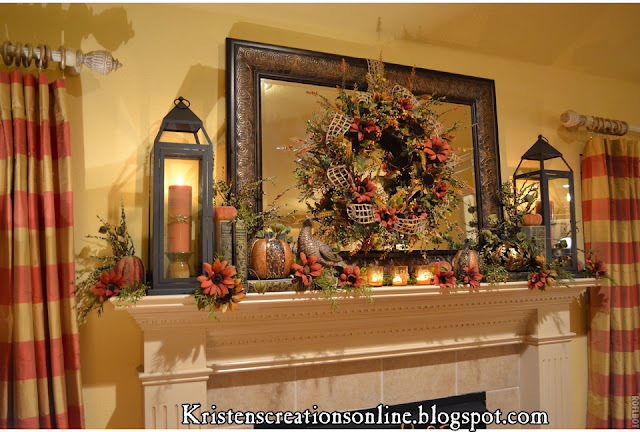 I love the rich colors in this one, perfect for fall. Here is a peek at SOME of my new fall flowers and berries...and there are more =0. I guess I better get busy! Welcome to Share Your Creations party #48! Now I'm back on track...Sorry to post two parties back to back. Since I was so late posting the party due to computer problems there were not a lot of entries. However, no matter how many join...there is always talent! 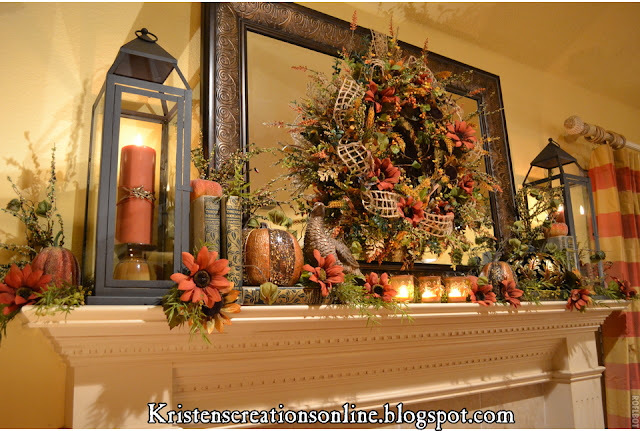 Check out this beautiful mantlescape at The Everyday Home. 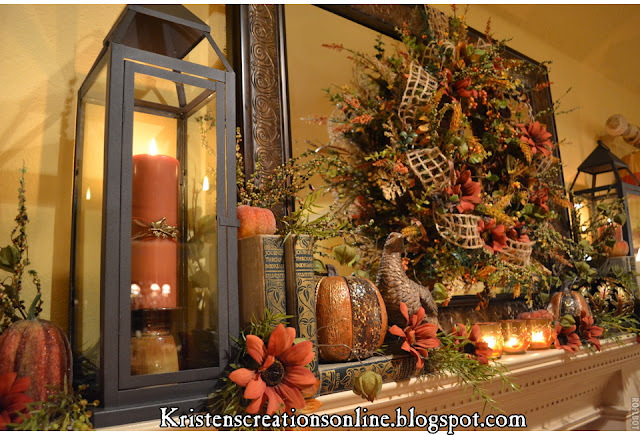 You will find lots of fall inspiration there! I love the paint and fabrics on these pretty chairs. 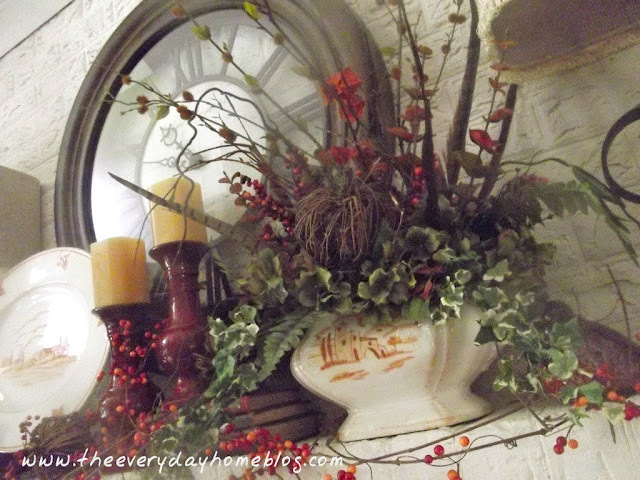 Check out Ramblings Of A Southern Gal for the before and afters. Oh how I love hydrangeas! This pretty blue and white tablescape was created by Pinky at Designs By Pinky. Since a lot of you liked the lantern swag I posted last week I thought I would show you one I made for fall. I have had several orders for these and have decided to sell them in my Etsy store. I am starting with fall and then will move into Christmas. I am making these so they can attach to your own lantern. I can make them in any size you would like! I will be doing all different ones for fall including some with pumpkins...so keep your eyes on my store for new items! I will also take special requests. It will be very simple to attach. It will tie around the top of the lantern and can easily be taken off to be changed out for the seasons.